Air Botswana flights booked via SouthAfrica.TO qualify to earn our exclusive travel vouchers. Simply email a writeup of your flight to cheapflights@southafrica.to and we'll send you flight discount vouchers. Easy! Ask an Agent - we are itching to find you the best flight deal. Air Botswana is based at the Sir Seretse Khama International Airport in Gabarone (Botswana), and operates regular flights to Johannesburg (South Africa), Harare (Zimbabwe), Victoria Falls (Zimbabwe), Maun (Botswana), Kasane (Botswana), and Francistown (Botswana). 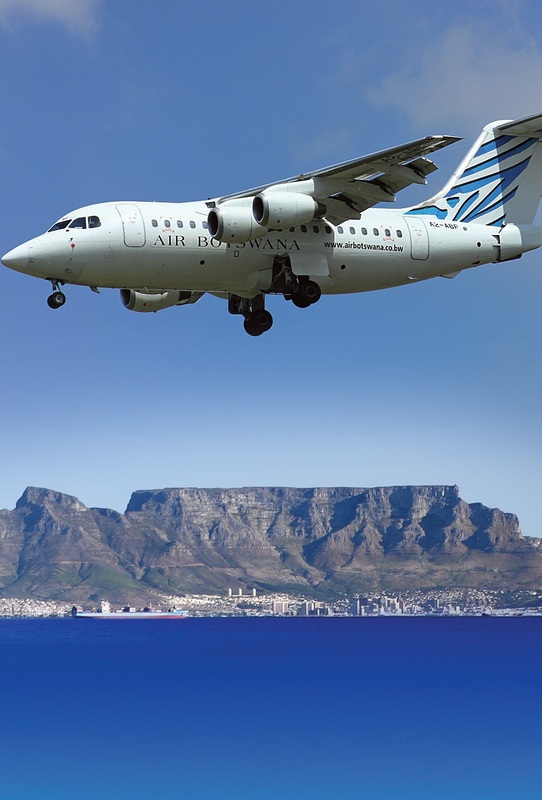 10 April 2015 : Air Botswana has cancelled their direct flight between Maun and Cape Town. The airline will stop operating the direct flight from the 4th of May 2015. The flight will be routed via Gaborone. The airline will add two weekly flights between Cape Town and Gaborone from the 4th of May. 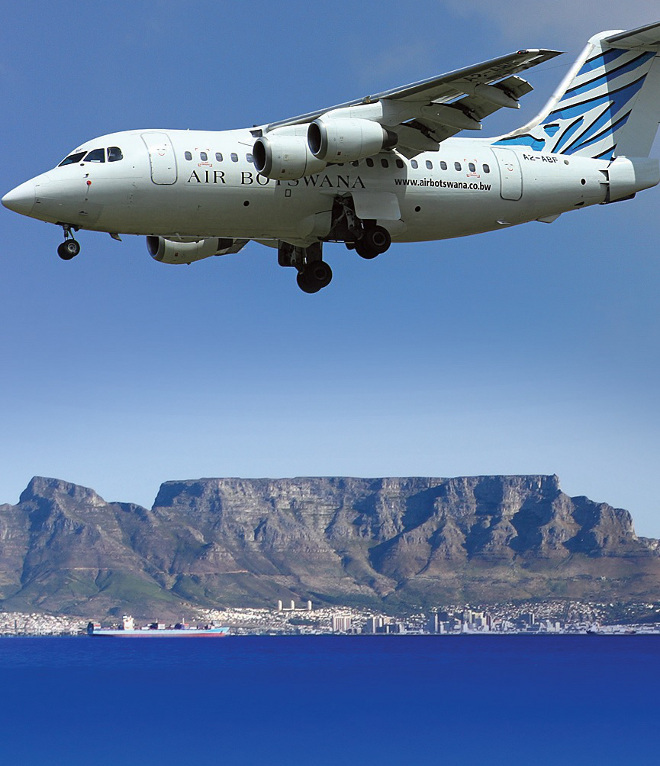 This will bring the total weekly flights between Gaborone and Cape Town by Air Botswana up to 4. Flights will be operated on Mondays, Wednesdays, Fridays and Sundays. 13 August 2014 : Air Botswana has announced that an airport ticketing service fee of R350 will be charged to passangers who purchase Air Botswana tickets from the airline’s ticketing offices at Johannesburg or Cape Town International from the 1st of September 2014. 3 Feb 2014 : In the 2014/2015 Botswana budget, P330m is allocated for a cash injection to Air Botswana. 10 Dec 2013 : Speaking to the Hospitality & Tourism Association, Botswana's Minister of Transport, Nonofo Molefhi, says that they are looking for airlines to partner with Air Botswana. 29 August 2013. Botswana's ambassador to Japan, Jacob Nkate, comments on his Facebook page : "Air Botswana needs help with equipment. Kasane cancelled yesterday and delayed today stranding many people including a family of 3 from Japan who had booked two nights at Mowana and whose holiday is now ruined." 30 July 2013. Two ATR72-500 turboprops which were bought in 2009 have been found to be unfit for use at Maun Airport, because of the high temperatures there. This follows the engine of one of the planes exploding mid-air in 2012. 30 May 2013. It's reported that two managers at Air Botswana have been suspended, possibly related to the 13 May incident in which an aircraft had to return to Gaborone after an engine blew apart. 17 Apr 2013. A rowdy passenger who was insulting staff members is offloaded from an Air Botswana flight at Maun Airport. The passenger was an employee of the Botswana Communications Regulatory Authority (he requested that his name not be published). 5 Apr 2013. Air Botswana decides to restart CPT - Maun flights; flying twice a week on Sundays & Thursdays. 1 Apr 2013. Air Botswana quits flying from Cape Town to Maun. 31 Mar 2013. Air Botswana planned to fly 3 weekly flights commence from Gaborone to Lanseria, served by ATR72s, but later cancelled this plan. Feb 2013. Air Botswana opens a "Pula Lounge" at Sir Seretse Khama International Airport in Gaborone, naming it after Botswana's currency. The lounge is available to members of the Teemane Club (Air Botswana's frequent flyer club). "Now our passengers will be able to conduct their business here before they fly out," said Robert Mpabanga, the commercial manager at Air Botswana. Want to book a cheap flight with Air Botswana? Subscribe to our mailing list and keep track of their flight specials. Cape Town to Gaborone with Air Botswana from ZAR3917* : Valid from 2013-06-23 to 2013-08-31 whilst there's still availability. *Terms and conditions apply, prices may have changed. Phone 011-390-3070 to book. a silver member gets a 5kg extra baggage allowance, a gold member 10kg extra and a diamond member 15kg extra. 21 Dec 2012. Ms Sakhile Nyoni-Reiling, General Manager at Air Botswana, resigns. Dec 2012. Paul Champane, Head of IT at Air Botswana, resigns to take up an opportunity at the Okavango Diamond Company. 30 Oct 2012. Three weekly flights commence from Maun to Victoria Falls (VFA). Flights from Cape Town to Gaborone, and Lanseria to Gaborone commence. Air Botswana has increased its fleet to 8 planes, following the purchase of an Avro RJ-85 from Lufthansa Airlines. The plane arrived in Botswana in late October. “The new jet has come at a time when the national airline is looking to expand its route network into other Southern African destinations,” said Mr Joe Motse, Air Botswana's Commercial Director. On its take-off to South Africa, an Air Botswana Jet, A2-ABF, experiences an engine blast. The pilot landed the plane and nobody was hurt. It's reported that Air Botswana lost P54m in its 2010/11 financial year. Air Botswana loses P45m in its 2009/2010 financial year. Air Botswana adds a Saturday flight from Gaborone to Harare, leaving Gaborone at 10h30 and arriving in Harare at 12h40. Air Botswana Johannesburg - Maun flights (direct) have been discontinued (Air Botswana continues operating the route in both directions via Sir Seretse Khama International Airport). Passengers travelling in either direction will now stay on board the aircraft during a short technical stop at Gaborone and then clear immigration and customs at their destination. Air Botswana receives its first ATR 72-500. Maemo Bantsi: "Air Botswana is more of a regional operator and a domestic operator, and our vision is to be the airline of first choice. And therefore, in this vision, we also have a mission statement, that says that, being an airline of first choice in the region, is that we will also be able to deliver high quality standards, world-class standards, and efficient operations. And in that regard, it is also therefore that we focus on our route in the network, within this region and therefore, in that respect, the acquisition of the 72-500 will help us in our program of expansion in our network services, for the new acquisition, because the ATR that we have just acquired has very good cabin elegance, it is also very good in terms of fuel efficiency, and also it will be a delight to our passengers, to have this type of aircraft within our fleet. One of the areas that we want to expand our services is within the tourism industry, and therefore this type of aircraft is scheduled to fly in the major tourist destinations. It will also increase the number of passengers that we, we have seen since that the number of passengers has increased over the past six months, within the areas that we have been flying. And we are also going to be introducing another route which is a direct flight from one of the second cities of Botswana, direct to Johannesburg, so therefore it will help us actually in terms of expansion of our route network. We know ATR to be very good in terms of fuel efficiency and also the reduction of noise in the aircraft which also helps, just general comfort of the 72-500 that we have experienced on the demo flight in Gaborone. When we did the demo , we invited a number of stake-holders, our tourist people, travel agents and general public just to have a feel of the aircraft. And the feedback that we got was that: You have to go for it. And we are definitely sure that the passengers will love this aircraft. ATR -600 series - Well, I've read that it's actually an improved version of the current 72-500, especially in terms of the cockpit, it will have a classic cockpit, which is also good for the pilots, and they will love that. And I believe also that it have a bit more power, with respect to the current fleet that we are operating, as a new generation type of aircraft, and even the, I understand it's more environmentally friendly, in terms of the issues of environmental matters. In one word I will just say that the ATR id the best in the regional aircraft manufacturers." Comair is named as the preferred bidder for the Air Botswana management contract. Botswana's cabinet decides not to accept Airlink's proposal that Air Botswana be wound down. Government invites companies to tender for the purchase of Air Botswana. Lance Brogden is appointed Chief Executive Officer of Air Botswana. Chris Phatswe, a grounded Air Botswana Captain, boards an otherwise empty ATR42 turboprop aircraft, takes off and asks to speak to the president. As the president is not in Botswana the vice president speaks to him. All attempts to convince him to land fail and after an hour in the air he crashlands into Air Botswana's other 2 parked ATR42s (Phatswe died in the crash), destroying 3 of Air Botswana's 4 planes (their fourth plane was grounded with technical difficulties at the time). It was later revealed that Phatswe was suffering from AIDS, although it is not known whether this played a role in his actions. Air Botswana becomes a government parastatal falling within the ambit of the Ministry of Works, Transport and Communications. An Air Botswana plane is featured in Jamie Uys's film "The Gods Must be Crazy". In Botswana's first major air diasaster, a WENELA DC 4 aircraft crashes in Francistown, killing some 70 people (mostly Malawian migrant workers in SA's mines). Botswana Airways replaces Botswana National Airways.